FAYETTEVILLE (WTVD) -- Victor Murray is without a doubt a fighter. Nearly two years after surgery to remove a brain tumor, the 18-year-old is back in a Charlotte hospital neurological ICU. The former Cape Fear High School wrestler cannot speak, walk, swallow, or blink but back at home, his community remains faithful and hopeful. 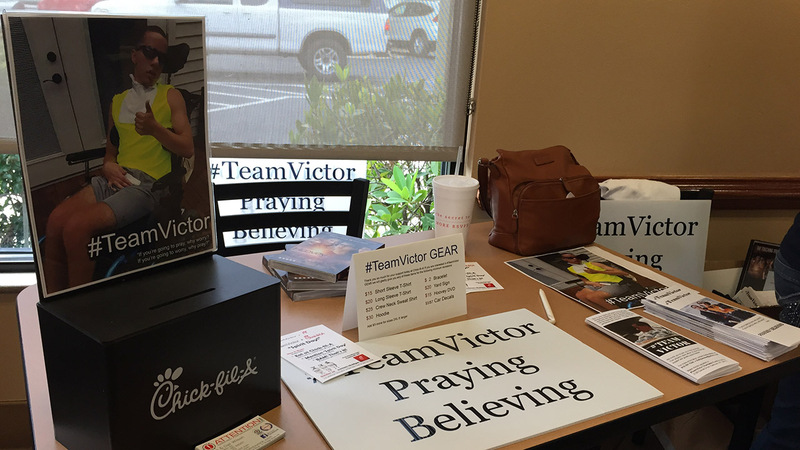 On Monday, the three Fayetteville Chick-Fil-A restaurants held #TeamVictor Spirit Days. A portion of proceeds from each sale went towards Murray's medical bills and helping his family get through a difficult time. ABC 11 has followed Murray through stronger days, including his recent senior prom and high school graduation in June. Read more: Teen shows courage in accepting diploma. If you'd like to donate to Murray's cause, you can make checks payable to #TeamVictor Charitable Fund and mail it to 2129 Daniel Drive, Eastover, NC 28312.